When Yahya Mokhtarzada found out Gogo inflight Wi-Fi had been sneakily charging him $40 for months, he decided to build a startup to make sure you’ll never get ripped off by a subscription again. That startup is Truebill, which Mokhtarzada launched in February with his brother, Idris, who previously cofounded a startup that sold for $117 million. 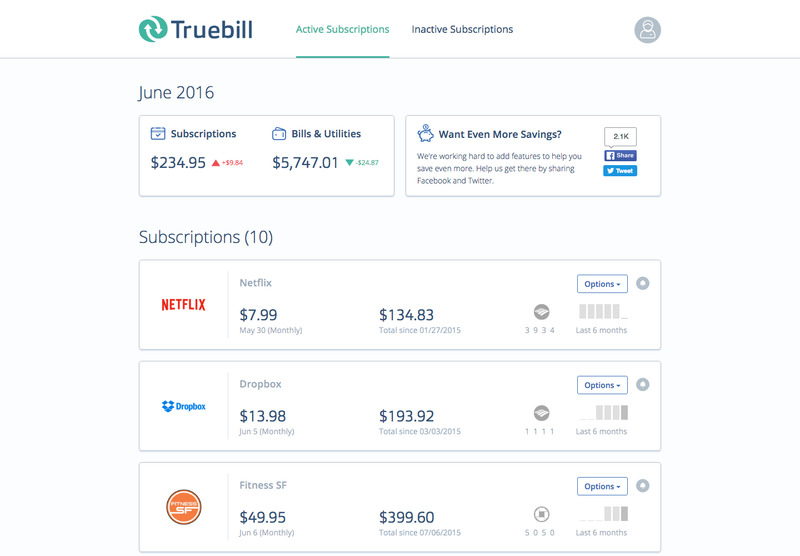 The concept of Truebill is simple: a single unified system that manages all your subscriptions, from your gym membership to Netflix, and helps you cancel them if you need to. Mokhtarzada thinks you will have more and more subscriptions in your life moving forward, and that means you’ll want a service to keep them all straight (and find new ones). He points out that popular software like Adobe Photoshop and Microsoft’s Office suite have moved toward subscription models, as have entertainment mainstays like Netflix and Spotify. Truebill’s research showed that users had doubled their number of subscriptions over the last 18 months, Mokhtarzada says. Mokhtarzada’s pitch for a subscription-filled future has proved compelling to 45,000 Truebill users so far. 25% of those have canceled at least one subscription on the platform, and have saved over $400 per year by doing so, Mokhtarzada says. 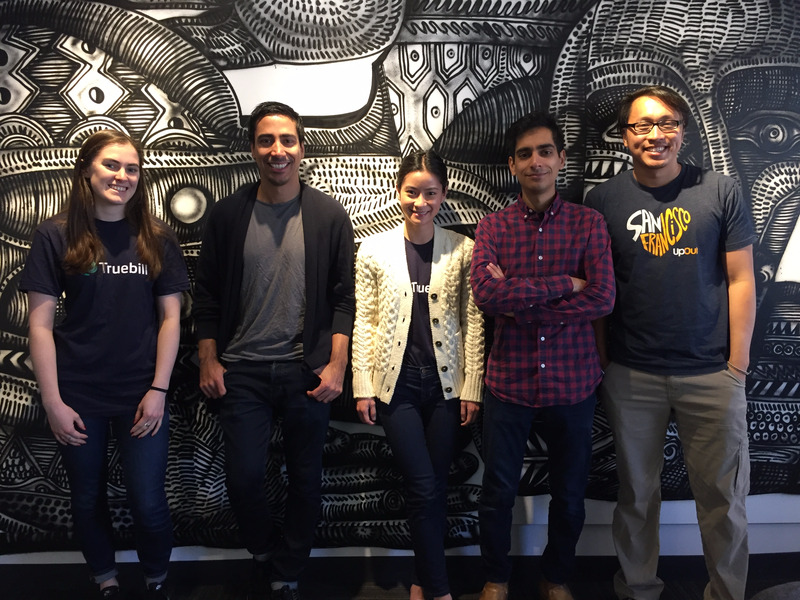 Now Truebill, which is backed by prominent startup incubator Y Combinator, has announced a $1.4 million round of seed funding from investors including Social Capital, Sherpa Ventures, and ITA Software founder David Baggett. Tracks which subscriptions you currently having. Helps you cancel them (hopefully with one click). Helps you find and buy new subscriptions using recommendations and one-click ordering. Lets you manage and personalise subscriptions that allow you to adjust things like frequency. Mokhtarzada’s 7-person team also plans to launch iOS and Android apps in the first half of July. While Mokhtarzada was initially driven to build the platform because of his fury at Gogo, he says sneaky subscriptions are very much part of the “old paradigm” of tricking customers. Most of the newer services try to make it easy to cancel, with Netflix as a prime example, he says. That’s one reason why Mokhtarzada sees a lot of the value in Truebill residing in discovering new subscriptions. And it helps that referral fees for discovery are Truebill’s eventual path toward revenue. 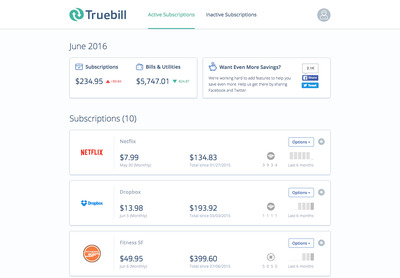 But right now, helping you easily cancel annoying subscriptions is one of Truebill’s perks. Sometimes that even means writing a certified letter on your behalf, as was the case with a gym Truebill ran into. There isn’t a charge for this, and more complicated procedures are sometimes completed by Truebill employees, though the goal is to automate as much as possible. “Gyms are just ridiculous,” Mokhtarzada adds. As to the most canceled subscriptions, Mokhtarzada says credit monitoring services and background checks are the ones that most often get the boot. Check out the platform for yourself at its website>>.